Swim Bournemouth Summer Level 3 Open Meet has been added to the downloads page of our website - takes place 20th /21st July, entries close 23rd June. 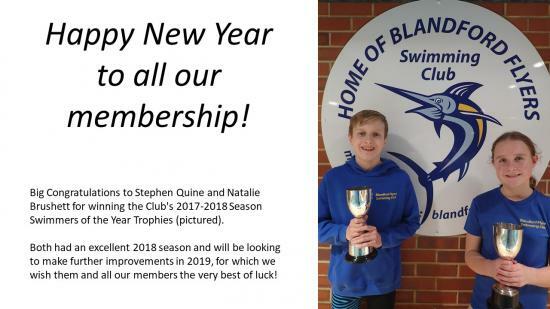 Congratulations to all swimmers who took part in this year's Novice League Galas. A fantastic team effort landed a 6th place finish in the "A" final on Saturday night and an 8th place overall in the League, which is an excellent result for our little club. Also, there will be no swimming at Bryanston on the Tuesdays either side of Easter Weekend (i.e. 16th and 23rd April) - other than Bank Holiday closures on Good Friday and Easter Sunday, all other training during the Easter Break will remain. Check out our downloads page for the latest Swim England Newsletter - full of useful links, offers and videos to help improve swimming technique. West Dorset June Level 3 Open Meet has been added to the downloads page of our website - takes place 1st / 2nd June, entries close 3rd May, so please ensure returns to Trevor/Tanya by 26th April latest. Please keep a regular lookout for further updates on email and on our website, otherwise if you have any questions then do not hesitate to ask. Many thanks and see you at training !